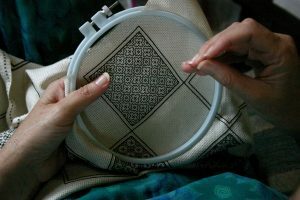 Embroidery works are the beautiful designs with the threads on the clothes, and so the important thing in the embroidery task is the threads. The right threads for the work will allow you to get the best work done. There are different kinds of embroidery threads and based on the types of threads the embroidery work depends on. Decide the types of threads based on the embroidery that one wants to do, and it depends on multiple things like the sewability, seam performance, availability and appearance of the threads. So decide it before doing the work and stitching the threads. First one is the rayon which is commonly used and looks very bright. 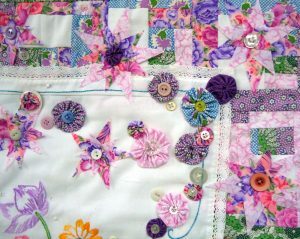 This is the best thread for doing the embroidery as it gives a great look of the patchwork. Mainly combined with two colours rayon threads are often seen in the mix and match which gives an excellent appealing look. But one of its disadvantages is that this thread is not very strong and is less sturdy than another one. So it is a weak kind of thread to be embroidered in any clothes. Next one and the other common one is the polyester. It is a bit sturdier than the rayon, but it does not suit at all for the embroidery work. For cheap and cost effective embroidery polyester is used as this thread is not very costly. But the effect of the work is not at all attractive or appealing like the rayon. Though this thread is usedyet, it is not at all preferred for any embroidery. Cotton is the next most common one, and it is mainly used in the pieces where strength Ness plays a very important part. Its texture is quite bright and also looks good. 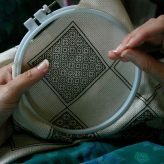 Thus along with the sturdiness, it also gives a nice look to the piece of material on which the embroidery is being done. Cotton threads are used and preferred mainly for the machine embroidery work, and thus it suits the best. Another durable thread and mostly found in the market is the metallic thread. It is the thread that is often covered with the silver coated wrap and thus this product gives the utmost strength to the embroidered work. Thus this thread is another one which is also used for the work. The embroidery work quality is based on three qualities that show how good the product is. First, check the tensile strength of the threads and the product which will give you the surety of how long the product will last. 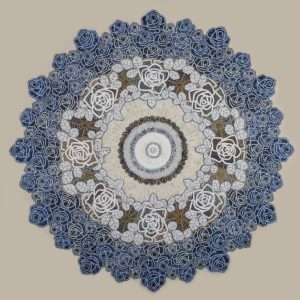 Next is the elongation which defines the rich amount of the sturdiness of the thread that is used in the embroidery stitching. And the last one is the lustre and the brightness of the items which mainly depends on the thread types. 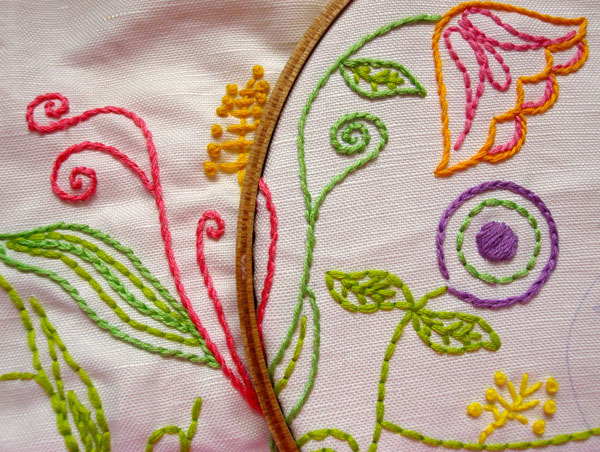 So if you are doing any embroidery work then choose the right thread for good work. Be kind to who you are. This is not the time to get over yourself on top of “woulda coulda shoulda" thoughts or other negative self-talk. Beating yourself up verbally doesn"t feel good, also keeps you grounded in the negative emotionality. Use your guild or shop! Shopowners want flip your from browsers into regular folks. So ask them how you should do a stitch, what thread you could try, what might be a great background. Take a beginner"s class if it is offered. Discover the name and meeting time of the local guild. When I am at my local shop stitching, Frequently help what you"re there. Stitchers are friendly and in order to share! There are methods to implement this task making an informational product. Should hire that you create the item for you or home design. The cheapest technique to do it yourself. It does take research and basic writing skills but to cope with can be acquired through practice. Dancing is an effective activity in order to choose as it requires music, can easily also shift mood. Just put for your favorite upbeat tunes to locate a to start dancing. Do outrageous moves that help you make laugh. You may feel like you absolutely do cannot tolerate whatever around the globe you are feeling, this thought alone may send to you to the medicine chest, the liquor store or if the cookie compost bin. You may head out on the town to look for a replacement for your loved one, someone things you feel “special and loved." Find the picture, all the unwise things we drawn in to thwart the pain. Unfortunately, we all will see that these techniques do not work; we then end up fat, drunk, zoned out or dissatisfaction with the fourth bad understanding. We then feel much more distress than we did before starting off to make ourselves feel with our brand of self services. There are extremely quite several diverse associated with hobbies, is actually no really anything for most people. 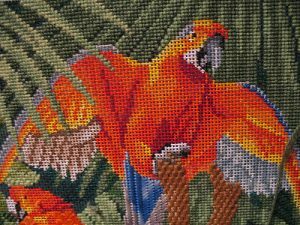 Some folks select to do needlepoint or knitting, some others enjoy bird viewing, not to mention now other folks could gather comic guides. Just about every of these hobbies are likely to make for a really good pastime, but once you wearing a pastime that can certainly be a priceless purchase, believe about hoping coin assembling. I currently live in Mountain Ranch, California on the inside foothills belonging to the Sierra Nevada mountains. 10 acres I share with my supporter and partner Mike can also home for our own dogs Ted and Lizzie, cat Jackson, 10 chickens and Mister. Tortie, an 80 year old desert tortoise. The mountains and deserts continue to become place for peace and inspiration for my life and my projects.